Julian Barnett creates performances that examine the social-political possibilities for transformation and empathy, through the lenses of philosophy, musicology, science, and the supernatural. Born in Tokyo and raised in California, he works as a choreographer, performer, and arts advocate/educator. He has received commissions from Danspace Project (NY), Tangente (Montreal), Kampnagel (Hamburg), Dansehallerne (Copenhagen), Dansateliers (Rotterdam), i-Dance Festival (Hong Kong), and more. 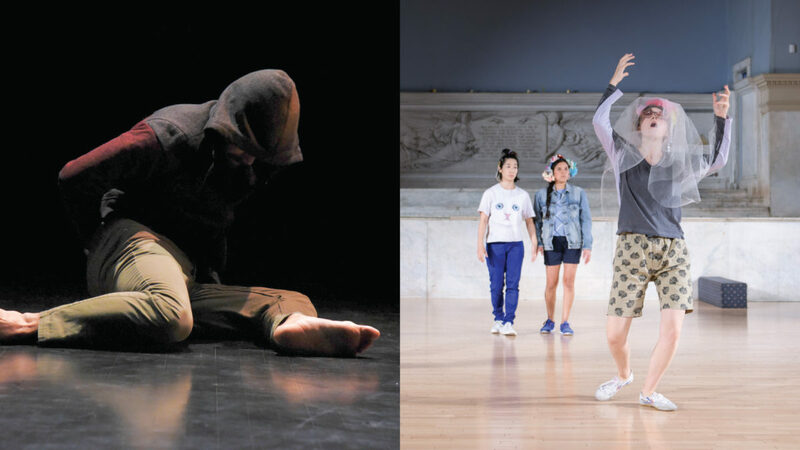 Julian was a danceWEB scholar at Impulstanz (Vienna) and a US/Japan Creative Artist Fellow, where he studied Butoh and began working with Kota Yamazaki. He has also performed with Jeanine Durning, Steve Paxton, Wally Cardona, Johannes Wieland and others. Mina Nishimura, from Tokyo, was introduced to butoh and improvisational dance through Kota Yamazaki. She was the danceweb scholar at Impulse Tanz in 2009, and has been the Artist-in-Residence at Brooklyn Arts Exchange, Chez Bushwick, Movement Research, and Camargo Foundation (France) while teaching at Movement Research, Brooklyn Studio for Dance, Bennington College, UC Davis and Ferris University (Japan). Most recently, she has danced for John Jasperse, Rashaun Mitchell+Silas Riener, Kota Yamazaki, Dean Moss and Vicky Shick. Her latest evening-length work “Bladder Inn. (and X, Y, Z, W)” was premiered at Danspace Project in the past February. Photo ofJulian Barnett by Pele Voncujovi; Photo of Mina Nishimura by Ian Douglas.